“This unit is 100% working condition, fully inspected and professionally serviced, everything works as it should. This Akai MPC 2000XL w/maxed RAM installed has been professionally serviced, brand new tact switches (no need to press hard or press several times), brand new jog wheel and fader slider posts, so basically you have a brand new boards here… also it was cleaned inside and outside completely. LCD display is bright and clear with no lines or dead pixels. Internal 100MB ZIP drive with a brand new (sealed) 100MB ZIP disk included and a power cable to help you start making beats just out of the box! 100MB ZIP disk = 69 floppies! 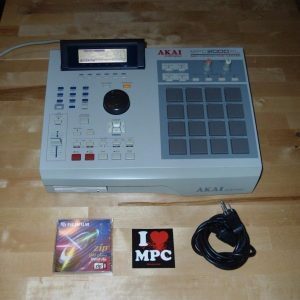 This is an used unit and being almost 20 years old (the Akai MPC2000XL was released in 1999!) you can expect some signs of wear like scratches/dents/paint chips but all that is just cosmetic and it is expected in a unit this old, but as stated before everything was replaced inside so it is working as new.